Using a “For Each” loop on an array was 3 times faster than a “For, Next” loop. 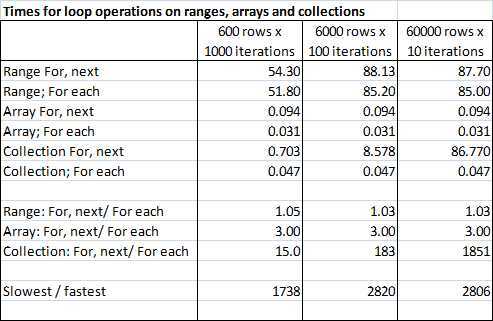 Using a “For Each” loop on a collection was almost as fast as a “For Each” loop with an array. Times for a “For, Next” loop with a collection were proportional to the square of the size of the collection. For the largest collection (60,000 items) this form of loop was nearly 2000 times slower than the “For Each” loop. Where possible use “For Each” loops, in preference to a “For, Next” loop. If a “For, Next” loop is necessary, use an array in preference to a collection. Avoid iterating through a range in any application where speed is important. The macro checkloop is currently set up for 10 iterations of 60,000 cells. If you want to change the parameters you need to change the NumReps value and the UserRng extent (at two locations) in the code. Note that for the loops using a range I have used 1/10 the number of iterations, and multiplied the time by 10, so the NumReps value should be 1/10 the actual number you want. On re-running I also found that the range times were about twice as fast as previously, but still very much slower than the array times, or the collection times with a for each loop. This entry was posted in Arrays, Excel, VBA and tagged Array, Collection, Excel, Loop, Range, VBA. Bookmark the permalink. I’m trying to chart your data but it the data for the For Next Collection for 60k rows looks off. Are you sure that number is correct? Are the units above seconds? and do the entries represent start to finish? What’s the relation of the second grouping of 3 to the first of 6? Titles look similar. Finally, what is represented on the slowest/fastest line? Jimmy – yes the time for the For-Next is roughly proportional to the square of the number of items in the collection, so if the number of rows goes up by a factor of 10 the execution time per loop increases by a factor of 100. I’m going to post the spreadsheet; please let me know if you find any blunders, but I’m pretty sure the times are right. Michael – Yes the units are seconds for the first group of 6. The next group of 3 is the ratio of the time for a for-next loop divided by the time for a for-each loop, and the final line is the slowest time divided by the fastest time. So that’s “/” as in divides and not “/” as in “and/or”. Since this would generally be a necessary step for most calculations involve collections, shouldn’t this be included in the calculation time of the two methods involving collections? Aside from that, a very instructive post – thank you! Looking at the code, I don’t think you are comparing like with like: some of your loops involve reading and writing back but others don’t. Sericanus – The range and array loops got their data straight from the spreadsheet, so I thought it would be unfair to include the time for building the collection, but certainly the collection times would be slowed down a little if this was included. Charles – I had a look at the timings including a write back to the spreadsheet at the end of each inner loop, and I also switched off recalculation. This (for the 600 rows x 1000 iterations case) reduced the range times to about 25 seconds, and increased the array times to about 5 seconds. This indicates that it is the write part of the read/write cycle that really takes the time when interacting with the spreadsheet. For the collection the only way I could see to make it work was to write one item at a time, and that is still running (started about 5 minutes ago). Is their away to copy a collection to the spreadsheet in one operation? Other than writing it to an array first, which seems like cheating for this exercise. For your runs with the ranges, how did you increment the range values without writing back to the spreadsheet? 1. Avoid looping through a collection with a for, next loop. 2. Write to the spreadsheet in large blocks of data wherever possible. 3. If you do need to write small blocks of data multiple times, switch recalculation to manual before you do it.